Oh dear, oh dear, oh dear. If Broken Age is Kickstarter’s poster boy for videogames, then Carmageddon: Max Damage is the deformed monster they’ll want to keep locked in the basement. The intention seems to have been to create something along the lines of a Mario Kart homage as envisioned by Quentin Tarantino in a particularly bad mood. 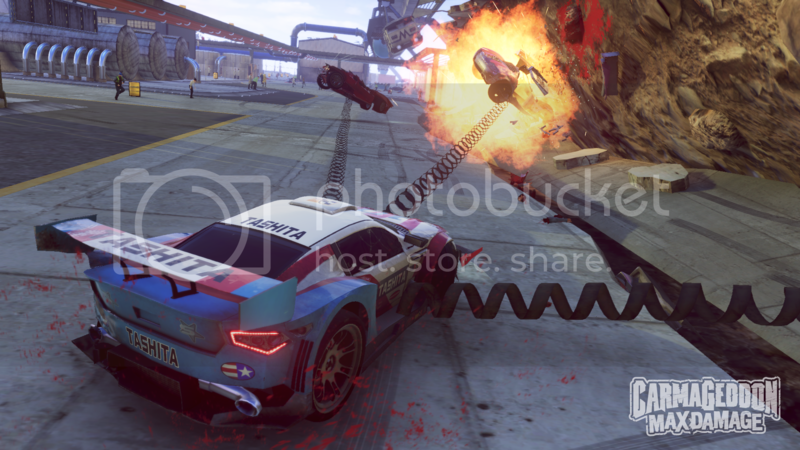 The reality is a technical mess that never should have been greenlit for release, and a distinct feeling that the Carmageddon name should have been left to rot in the past. What’s perhaps most frustrating is that the template used is perfectly sound, and should really have been very difficult to so spectacularly mess up. Picture it: six cars, modded to cause maximum damage to pedestrians (or “peds”) and other vehicles, racing around areas with a large amount of freedom and potential for shortcuts. Standard races can be won in one of three ways. Complete all the laps if you’re boring, wreck all your opponents if you’re an aggressive maniac, or kill every last ped if you’re the sort of person the authorities have on a list. Win however you want; just win. Then there are events with specific goals, such as one where you need to be the first to reach ten randomly-placed checkpoints, or to kill ten specifically marked peds. Throw pickups into the mix – weapons, ped effects, temporary passive boosts, free repairs, even negative effects on yourself if you’re unlucky – and, with the welcome bonus of online multiplayer, you have addictive (if politically incorrect) mayhem that will keep you coming back again and again. At least, that’s the way it should have worked. The standard price for this seems to be £24.99, but that’s about £24 too expensive. Not just because it looks flippin’ awful. And make no mistake, it really does look bad. Graphics that are reminiscent of a PS2 game – an ugly PS2 game – and yet still utterly incapable of holding a steady frame rate for more than ten seconds at a time (if you’re lucky). If you’re disgusted at the sight of these retro NPCs exploding into red pixels, then – even though some of them are in wheelchairs – you must be trying really hard to be offended. The game does NOT look like this. The main fault with the game, the one that does the most damage to the experience, is the handling. Your default car has really, really bad handling that has no place in a game released in 2016. It’s no exaggeration to say that at times, just keeping it in a straight line or making a simple turn is a battle in itself. 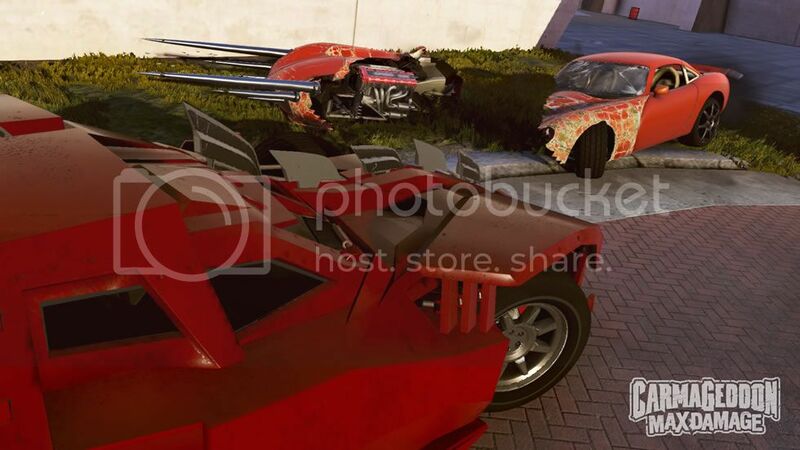 The good news is that you can unlock more cars, as events will usually mark one as up for grabs if you can wreck it. The bad news is that some of these cars have even worse handling, to the point where it is literally broken and unfit for purpose. Only by some freak accident will these ones behave as you intend them to. You might think this means that winning races offline is impossible, but not so! Only, unfortunately, because the AI is abysmal. One of their favourite tricks is to try to wreck you at every opportunity but, oddly, they usually try to achieve this by constantly driving into you at incredibly low speeds (which deals no damage whatsoever). All this achieves is that it makes your car yet more difficult to control, which is perversely impressive in itself. On more than one occasion we’ve seen opponents driving completely the wrong way around a track, with no discernible tactic or goal in mind. Generally speaking AI seems to have little or no interest in winning a race, meaning completing laps for the win is usually pretty easy if you can bear to wrestle with the controls for that long. 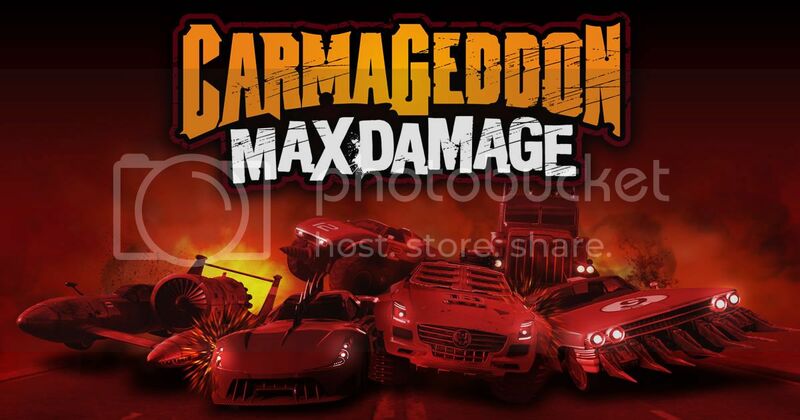 Carmageddon: Max Damage needs many things, but ways to cripple car handling even more is very much not one of them. Apart from the aforementioned opponents gently hugging your car, though, you also have slippy-slidey snow environments and a “jelly suspension” status that you can get lumbered with when trying to nab a powerup. It beggars belief. You may well wonder if Stainless Games have even tried playing their own game. Even the bullshots aren’t particularly impressive. You may not be shocked to hear that the online side of the game, while instantly better than offline (if only because of the removal of AI opponents), is also something of a lost cause. Everybody’s stuck with the same train crash of a handling model, but that’s pretty hard to interpret as a plus. It’s almost certainly down to the handling, in fact, that matches will usually finish before anybody’s reached the score limit (say, a certain number of wrecked opponents). The closest thing to fun is ‘Checkpoint Stampede’ (with the randomly spawned checkpoints, one at a time), which you can even squeeze a little enjoyment from when trying to avoid AI. But does this really sound like a good use of your time and money? Fixing the fundamental and completely unforgivable flaw of shocking handling would instantly improve this game quite a lot. That would do nothing for the AI though, and the final nail in the coffin is a handful of bugs. Once, even when exiting to menu and going back in again, every one of our cars had disappeared apart from the one we’d most recently used. Another time, the game froze while trying to load a race. It was with no great reluctance that we took this opportunity to turn the game off for the last time, and turn our thoughts to this review.